17 Palms Kauai is two Kauai vacation cottages in a garden setting, rated #1 by Trip Advisor, and named by Conde Nast Traveler Magazine as "one of the 20 perfect places to stay in Hawaii" and one of the top-5 in Kauai, a private garden oasis adjacent to Wailua Bay (made famous in Elvis' Blue Hawaii). Step back into a slower pace, away from crowded resorts, and into our secret slice of paradise where we have been consistently top rated by our guests for over fourteen years in a row. You'll find hundreds of reviews online. Everything you need during your Kauai vacation is a short walk away. We are across the street from the beach access path (two minutes to the sand) and only one block from the Coconut Marketplace, Kinipopo Shopping Village, and many nearby shops, grocery stores and restaurants, coffee roaster, live music, farmer's market, and much more. You can rent bikes and ride the east shore path along over eight miles of coast, just by going out the back gate. Surrounded by 17 majestic coco palms, the two cottages sit at opposite sides of a lushly planted garden. Passion fruit and thumbergia vines cover the fences that enclose the property. The fruit of mango, fig, banana and avocado trees are yours for the picking. Walk outside and take an outdoor shower. A bamboo-grilling pavilion equipped with an infrared propane gas grill is next to the covered Kubo (outdoor bamboo hut) - the ideal spot for dinner or a snooze. 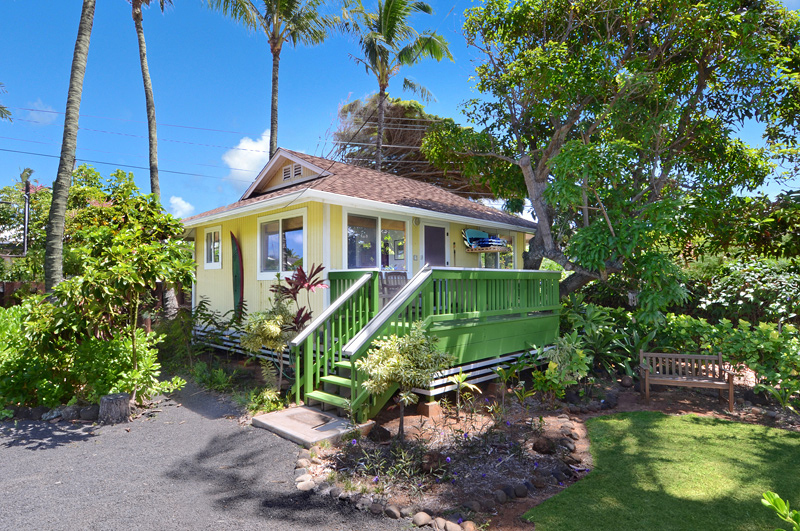 Whether rented separately or together, each is the perfect Kauai cottage for your Hawaiian honeymoon, anniversary, romantic getaway or family retreat. 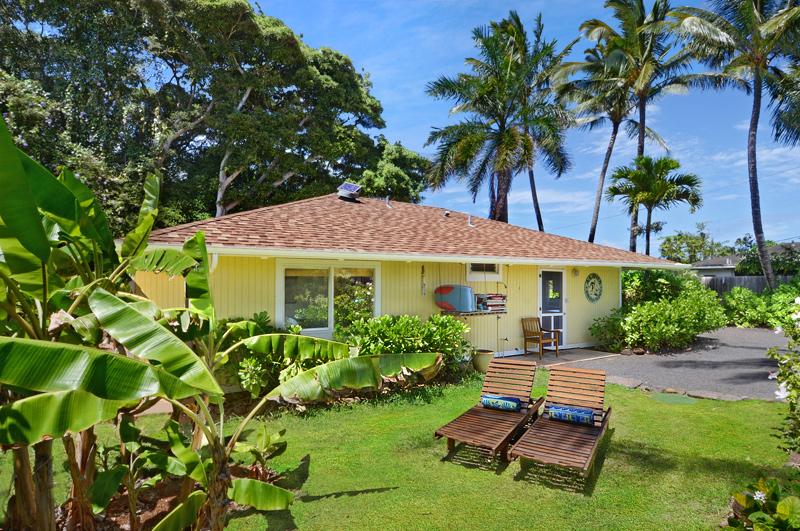 17 Palms is located along the Coconut Coast (Kapaa town) on the east side of the island, minutes from the Wailua River. While only a block away from the beach, the Coconut Marketplace, and many restaurants, the cottages enjoy the privacy of a lushly planted and fenced garden setting. The North and South shores of Kauai are each only a 45-minute drive away. 17 Palms Kauai is the perfect Kauai vacation rental for families, couples and honeymooners alike. The beauty of Wailua Bay is surely why the ancient Hawaiians chose it as the site for a heiau (sacred place) the remains of which are still visible at the end of the beach access path, considered sacred and included on the Historic Register. A two-minute walk down the access path leads you to three very different swimming areas. On the left is open ocean, great for surfing, swimming, and walking and to the right is a small bay, ideal for swimming and boogie boarding. You will also find the baby beach, made safe by boulders protecting it from the waves (great for little kids). We've tried to think of everything to make you feel at home: high quality beds and linens, down and alternative down pillows, comforters, plush beach and bath towels, beach chairs, modern and fully equipped kitchens - all beautifully decorated and maintained to the highest standards.